The Baroness Pannonica de Koenigswarter was known for her friendship with Charlie Parker, Thelonious Monk and other leading musicians of the bop and post-bop periods. She was born a Rothschild -- as Jean Bach puts it, a vraie Rotschild -- of the English branch of the lavishly moneyed international banking family. She married into minor royalty, was an ambulance driver in the Free French resistance during World War Two, lived in Mexico for a time and popped up in New York in 1951. Her interest in jazz led her to become a patron of a number of musicians. She is honored in the titles of several compositions including Monk's "Pannonica" and Horace Silver's "Nica's Dream," first recorded in an unforgettable version by the original edition of Art Blakey's jazz messengers. Nica's favorite Bentley S1, one of several Bentleys and Rolls Royces she owned, was noted for its disposition around Manhattan, often in front of jazz clubs where parking was not necessarily sanctioned by the city. 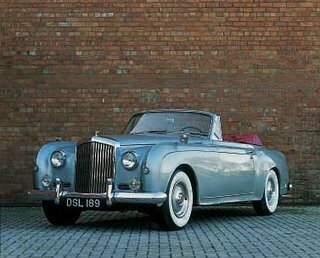 The Baroness died in 1988, but her fame and that of the Bentley continue. A Rifftides reader in New Zealand who is a Bentley collector asked a while back if I had stories about Nica and the Bentley. I hadn't, but I asked Jean Bach, the filmaker of A Great Day in Harlem, who knew Nica. She replied with a letter that I forwarded to New Zealand. Jean gave permission to use it here as well. It gives a sense of Nica's personality and of her dedication to Monk in his later days. For that matter, it gives a sense of the delightful Mrs. Bach. In the early fifties, a fashion photographer friend of our asked my late husband to round up some musicians for a party on his roof. The worlds of jazz and fashion were just beginning to fuse, and Bob came up with an assortment of stars that soon became the Jazz Messengers. Outside the building I spotted a Bentley and a Rolls. "Must be some heavy garmentos," I thought. And then I met the driver of the Bentley - the very British, very fragrant Baroness. "You like my scent? I think it's my daughter's - Jonka's." I think the Bentley was the band bus for the musicians, and I guess the Rolls followed with the instruments. A vraie Rothschild, she was one of several fascinating siblings. Her sister was the author of a book titled, Dear Lord Rothschild, which was the opening line of a letter from someone named Balfour - probably a first draft of the Balfour declaration. Nica's brother, Lord Victor Rothschild, was studying piano with Teddy Wilson, which is how and when she got turned onto jazz. When she immigrated to the U.S., she settled in a house just across the Hudson River from Manhattan* with several of her children and more than five or six cats. Letters from her were always datelined, "The Cat House." I spotted the Bentley outside a nearby piano bar one night, and since I had a leg of lamb roasting slowly in the oven, I popped in to see if she'd care to join me and a couple of friends for dinner. I gave her the whole menu, which appeared to meet her approval, and we started to walk back to my house, when she suddenly said, "Good heavens, what time is it?" Turns out she was already late for Thelonious Monk's night-time tray. As Monk had become more and more eccentric, Nica and Monk's wife, Nellie, had agreed that it would be more convenient for him to move into chez Koenigswarter, where he could spend his days and nights in his own room, where each meal would be delivered on a tray, and he could dine alone. I once asked the pianist Barry Harris, who also had a room in Nica's house, "Does someone (usually Nica) always deliver the tray" "Yes, and they'd better not ask me to bring one," he answered. Even though Charlie Parker died in her posh Manhattan apartment, she always maintained that her favorite musician of all time was Monk. Another jazz musician with good taste was the late saxophone/trumpet player, bandleader, composer, arranger Benny Carter. He lived in the Hollywood Hills, and negotiated those twists and turns in a Rolls Royce. When he died, the Rolls passed along to James Moody of "Moody's Mood for Love" fame. *The Baroness's first New York residence was in the Stanhope hotel, where Parker died in her apartment in 1955. Then she lived in the Bolivar hotel, made famous by Monk's "Ba-Lue Bolivar Ba-Lues-Are," before buying the house overlooking Weehawken, New Jersey, on the Hudson River. To see a picture of her Bentley S1 and read a bit about its history, go here.